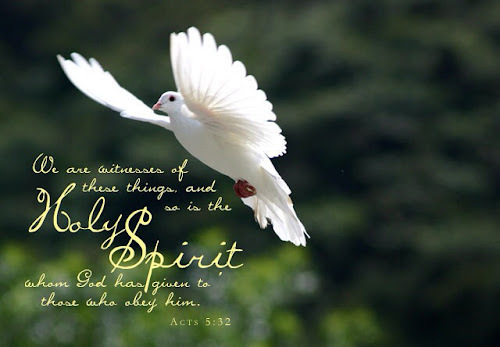 The power that is ushered into our lives by the Holy Spirit is an amazing thing. Recently at our church, there has been a special "presence" of this power that has brought about things that often words cannot explain. People talk to me about how God healed their bodies, married folks on the brink of divorce suddenly reconcile, and even those with deep emotional wounds have spoken of a comfort that they've felt just being in a service. As a regular boy from Ohio with a great deal of insecurity and sometimes a little fear, I know that these incredible things have nothing to do with me and everything to do with Gods power. When we ask Jesus to live in our heart, we activate this awesome power to begin to work in our lives. It "comes upon us" and things change. It is then that we go and talk to others about this power and share our story. That my friends is the plan that God had since the beginning of the church. Hopefully you are already in a local fellowship where this "spirit" is allowed and encouraged. This power is special when it's practiced the right way and it always brings about a beneficial result. People are engaged with Gods plan, they smile and there is a warmth that you can truly feel. If you are not connected to spirit led believers, perhaps this Easter season would be a great time to let some of that power come upon YOU. May you feel a special presence of the Holy Spirit and his power today!